About 5 miles south of central Manchester, there is an extensive series of parks and river paths that form a wonderful greenway, allowing for an extensive run. 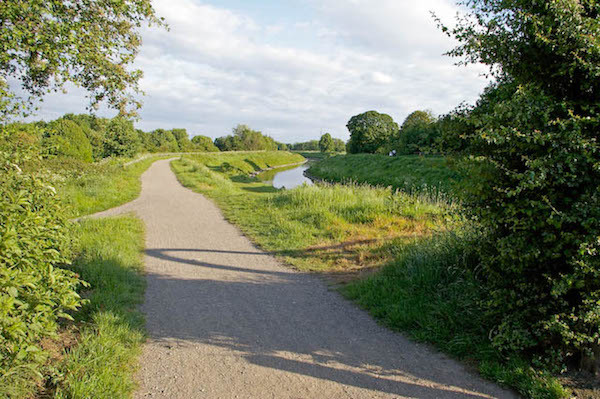 The path along the River Mersey, incorporating the Manchester section of the 213-mile Trans Pennine Trail, runs east-west along the water through several parks and fields. We’ve mapped out a 9 k (5.6 mile) route along the river (also marked as Bike Trail N62 in parts), starting at Simon’s Bridge at the Didsbury Sports Ground, to the intersection with the Bridgewater Way Path along the Rochdale Canal, just north of the M60. In sections, there are paths along both sides of the river, with periodic connector bridges. Running from east to west, you’ll pass through Mersey Bank Playing Fields near Princess Rd. (2m mark), Chorlton Water Park (3m), Hardy Farm (4.5m), and Ivy Green. The River Mersey path continues…for miles west. You can also hop on the Bridgewater Way path, heading north or south. If you lack a car, one adventure could be to take the train to East Didsbury, and then the light rail back from Dane Road or Strefford. Platt Fields Park in South Manchester is home to Parkrun, a free group 5k held every Saturday morning. You can see the course map and learn more here.